Back in 2014, Facebook introduced an app called Rooms, which allowed people to pseudonymously start and join interest-based public chats. However, it didn’t garner much traction and was shut down in 2015. 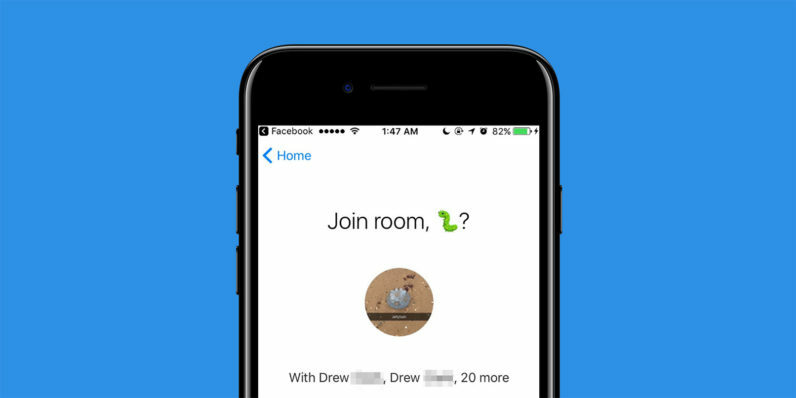 Now, TechCrunch reports that code buried in Messenger’s iOS app, spotted by tech evangelist Chris Messina, shows that Facebook has a ‘Rooms’ feature in the works again. Rooms are for public conversations about topics and interests. Each room has a link that can be shared so anyone on Messenger can join the conversation. From the code, as well as from the above screenshots provided to TechCrunch by Hoan Do, it looks like you can start a public room, join other rooms, and invite people to join you in a room by sharing a link to it. Facebook remained tight-lipped about the new feature, only saying that it ocassionally runs “small tests”. While Facebook could stand to increase engagement with a public chat feature, it’s important to remember that the standalone Rooms app bombed. It’s likely that there are several reasons behind that, and the company will need to figure them all out if it wants to make the second coming of Rooms a success. That being said, it now has a much more mature app in place, in the form of Messenger, to enable people to engage in public chats. That, combined with its powerful Bot framework, could help Facebook create a solid experience for people who want to discuss their interests, and allow developers to enhance these rooms with useful functionality. Even if Facebook decides to launch Rooms publicly, it might be a while before it does so. The company seems to be currently focused on rolling out features for video. In May, it launched a Live Video Graph to help users find interesting segments in broadcasts; most recently, it added Instant Video to Messenger and is now slated to bring Facebook Live to desktops soon.